First we brought you our top 10 reviews of the year, now let’s have a look at the top 10 videos on paultan.org. We’ve compiled this list after scouring the films that we have published on both YouTube and Facebook, combining the views on both sites to come up with the roll of videos you see below. 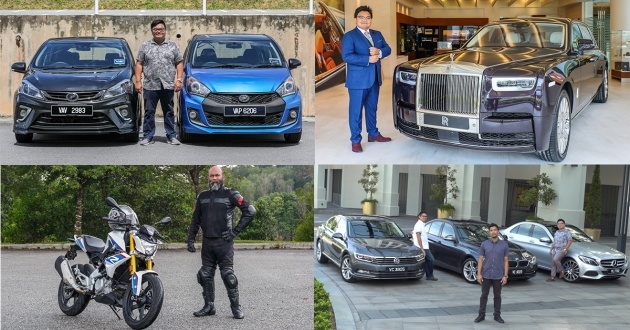 As you can tell, Malaysians have been quite varied in their viewing tastes this year, with vehicles that range from a multi-million ringgit super limousine to a humble family hatchback. Numerous bikes too, including an Italian cruiser, an entry-level motorcycle from Munich and a nimble runabout scooter. There’s something for everyone, so sit back, grab a bowl of popcorn, and enjoy. We start the list with a bike review. Yamaha hit the ground running with last year’s NMax, but it needed something to fill in the gap in the premium segment. Enter the NVX 155, which comes with a sportier, more aggressive design and features like ABS, keyless start and automatic engine start/stop. At RM10,500, it’s a little bit pricey for a ditty scooter, so we took it for a spin to find out if it was any good. Our tour of the new Phantom got a surprising amount of traction with viewers, especially considering the more humdrum vehicles found elsewhere in this lineup. Of course, with a price that starts at RM2.2 million (before taxes) and brimmed with features such as powered coach doors, a “gallery” for art connoisseurs and a 6.75 litre biturbo V12 making a whopping 900 Nm of torque, it’s no wonder it grabbed the attention. It’s been a long time coming, the BMW G 310 R. Part of a collaboration with India’s TVS originally announced in 2013, the entry-level Motorrad – the company’s first modern sub-500 cc bike – was first shown in 2015 before finally going on sale here in August; its juicy price tag of RM26,900 made everyone sit up and take notice. Our video review looks at whether it’s a real BMW bike, or just a pretender with a propeller badge. One of the biggest launches of the year was the new CR-V, which shook up the midsize SUV market with a new turbocharged engine, a high level of standard equipment and the introduction of the Honda Sensing suite of driver assists in Malaysia. Clearly, many were wondering how the car compared to its predecessor, which explains the high view count of our new versus old comparison. Just edging out the CR-V is its stablemate, the facelifted City. Malaysia’s best-selling B-segment sedan got a shot in the arm in March – the freshened exterior and extra kit put it in an even more unassailable position at the top of the class. Before the launch, we gave a quick walk-around preview of some of the changes made, and while we didn’t get access to the interior at the time, it still made our top 10. The Diavel was already a rather leisurely cruiser, so when Ducati rocked up with the Harley-Davidson-aping XDiavel, we were sceptical to say the least. It has all the right ingredients – a 156 hp/129 Nm 1,262 cc Testastretta V-twin engine with variable valve timing, a trellis frame and superbike brakes and suspension – but have all these been compromised by an American-friendly approach? This review sought to find that out. The acquisition of Proton by Chinese giant Geely was all anyone could talk about in 2017, and one of the big outcomes of the news was that the national carmaker would be launching its very first SUV next year based on the midsize Boyue. The company brought along an example during the signing of a definitive agreement finalising the partnership, and as usual we were on hand to provide a walk-around tour of the car. We kicked off the fourth season of the Driven Web Series with a bang, comparing the two premium plug-in hybrids in Malaysia – the 330e and the C 350 e. Just for good measure, we had the new Passat tag along as an cut-price alternative, with its minimalist style, classy cabin and proven engine and gearbox from the Golf GTI. We’ll be continuing the season into 2018, so stay tuned. Another car that bucked the mainstream trend was the Civic Type R – a bewinged hot hatch that set the lap record for a front-wheel drive production vehicle on the hallowed Nürburgring Nordschleife. The spiritual successor to the only Type R officially sold in Malaysia, the FD2, the new FK8 combines outlandish styling, a 310 PS 2.0 litre turbo four and a honest-to-god six-speed manual transmission. All for a hefty RM320,000. Of course, as launches go, nothing can top the new Myvi. It’s easy to forget that the car was at one point Perodua’s best-selling model – what with the Axia usurping its crown in recent years – but the company brought the big guns with the third generation. There’s a pair of new engines, a surprising amount of standard kit (including LED headlights and keyless entry) and a swathe of safety equipment that includes segment-first autonomous emergency braking. We test them all and more in our full, in-depth review here. 2018 Myvi No.1 truly Love of the nation. Boyue havent even start selling in MY alredi got 4th place. Imagine how it will be when it does. The response is so overwhelming! 2nd place, Honda Civic Type R FK8. Must be overwhelming sales response too! can’t even do well with local made cars, now want to try to sell China made cars. you think Cherry and Haval selling well? Breathless with anticipation. Sejuta peminat SUV rakyat MY cant wait for this to arrive on our shores. Any video with fat boy in it is a fav video k !! I agree , i like Mr Hafriz Shah better than any other person to host.